The S Pen has a surprising wealth of functionality in terms of writing or drawing, but it can also be used to navigate the UI. With the button on its side, you can do gestures - a swipe left is back, a swipe down opens up the context menu and a double tap opens the S Memo mini app. The S Memo app lets you scribble notes with the S Pen (or your finger). You can use various pen styles and colors. There are undo/redo buttons and an eraser if you mess something up. You can insert images from the gallery, other memos and even part of a map. The app also has some pretty advanced functionality. It can recognize shapes, for example, so our squiggly squares and circles looked perfect. It can do standard text recognition too and, more impressively, recognize and calculate mathematical formulas! Keep in mind that while in edit mode, you can use two fingers to pan around a document (using just one would draw a line instead). The app is quite handy - with the month view in portrait, you can select a day and all events for that date will be listed at the bottom of the screen. 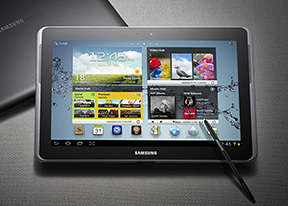 Photoshop Touch makes a serious bid to replace desktop Photoshop and make the Samsung Galaxy Note 10.1 a dedicated tablet for artists. It's fairly simple to use with an intuitive interface but there's a set of 13 tutorials just in case to teach you how to use the app. They come with all the required photos preloaded too. Photoshop Touch features most of the things you're used to in the desktop apps - layers with opacity and blend modes (no layer styles though), various image adjustments and effects, selection tools, clone stamp tool and so on. Using a stylus is already a more natural way to draw than your fingers, but the S Pen has one extra feature - it allows you to use different amounts of pressure, which dynamically control the brush width. It's very sensitive and there are a lot of pressure levels available. Adobe Ideas is a much more basic sketching tool. It has two layers - one to draw on and another one as a background image. You only get a brush (with customizable size, color and opacity) and an eraser. Ideas is meant to let you quickly sketch things to later upload to Adobe's Creative Cloud.